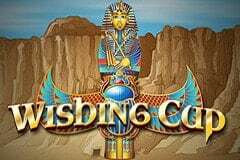 Wishing Cup is an Ancient Egyptian themed video slot and one which largely focuses on the treasures of Tutankhamun. In that regard, it isn’t that original of a slot machine game. However, players may still find some of the features that the Wishing Cup has to offer rather endearing. Players can expect to be able to spin the reels of this slot and bag expanding wilds, secret bonuses, and free spins as they go. Wishing Cup has been designed and developed by Rival Gaming, so it should be available to play at all good casinos offering Rival software, especially those which happen to cater to players based in the United States. Wishing Cup is quite like their i-slots range and anybody who has tried their hand at those slots before should know what to expect with this game. Located below the reels of this slot machine are the buttons you need to alter your bets. They are mildly thematic in design, but not over the top in that regard. Players can choose to select coin values which range from $0.01 up to $0.25 in all, and at the same time select as many as 10 coins per payline. Players are also at liberty to adjust any of this slot’s 25 paylines. At its cheapest, this slot is going to set you back around $0.01 per line per spin. At its costliest, it will see you wagering up to $62.50 per spin, which isn’t too severe for a slot of this calibre. Wild symbols: Wild symbols expand in this slot machine game, and they can expand upwards to occupy whole reels at a time. Wild symbols can only appear on the first, second, third, and fourth reels of the slot. These symbols can replace all other icons in the game. Wilds appear as cup symbols. Free spin symbols: Wishing Cup’s free spin symbols are represented by Tutankhamun’s death mask. These symbols can offer you scattered wins when they appear on the reels, and trigger a free spins bonus round. Free spin bonus: Players will start the free spins bonus round with just 7 spins for 3 scatters. Land 4 or 5 scatters and you will start the bonus with 10 or 15 free games, respectively. During the free spins feature, the third reel will remain wild for the duration of the feature. Secret Passage bonus: The tomb in this slot is filled with hidden passageways. During the base game, the Eye of Horus may randomly pop up, and when it does a hidden icon will be revealed following the conclusion of a spin. The best paying symbols in the slot are not the accessories or the high playing card symbols, but the gods themselves. Land 5 of the Horus or Anubis symbols on a payline and you can win as much as 750, or even 1,500 coins. However, if you wish to bag the non-progressive jackpot, you will need to line up 5 Osiris icons on a line. This can see you win as much as a cool 2,000 coins in total. 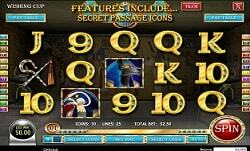 This is your run-of-the-mill Ancient Egyptian themed video slot. There is no reason to be particularly blown away with what this slot offers, though nor is there any reason to be terribly upset. Graphically it is top drawer, and its special features are impressive enough for a Rival Gaming title. Wins occur frequently enough to be pleasing, too. Wishing Cup is a decent slot, though a predictable one at the end of the day.